Being a person that is intrigued by spooky tales, I will be blogging this entire Halloween week about haunted places. Each day will focus on a different city that I have visited and researched. First up...Hollywood, California. 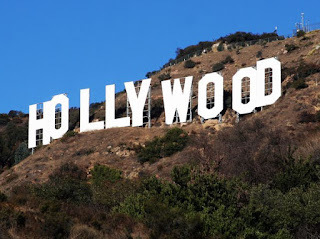 Hollywood is the land where dreams are made and stars are born. That is what they always say, right? Unfortunately, it is also the land of those who didn't reach the stars. The land of drug overdoses, murders and unsolved mysteries. Some of the people who did make it, though, seem to love it so much that they choose to stick around. Here are some of their stories. The ironic thing about Peg Entwistle is that had she of waited just a little longer her big acting break would have came. Two days after her death her Uncle Harold found a letter in her mail from the Beverly Hills Playhouse. The playhouse was offering her the lead role in their next production. Even stranger, that role was to play a beautiful woman who commits suicide! The Hollywood Roosevelt Hotel, located at 7000 Hollywood Blvd, is said to have two very famous ghosts. The first of these is Montgomery Clift who is believed to haunt room #928 where he once stayed. Sounds of trumpet playing, pacing and lines being recited have been observed at times when the room is supposed to be empty. The second starlet that keeps coming back to the Roosevelt is Marilyn Monroe. Marilyn is said to haunt a full length mirror that once was in the room where she had stayed. The mirror had been moved into an open area on the lower level of the hotel and patrons had reported seeing her ghostly figure in the reflection. The Mann's Chinese Theater has a long history of movie stars, premiers and also ghosts. Several different ones in fact are said to haunt this building at 6925 Hollywood Blvd. The youngest of the people said to be hanging around after death is a little girl named Annabelle. Another such visitor is believed to be a stagehand, Fritz, who hung himself in the theater, but still comes back to move the curtains. In 1982 Victor Kilian, an actor who lived near the theater, was murdered in his apartment. Many believe that he still roams the blocks from his apartment to the theater. Perhaps he is trying to help track down the person who stole his life, since the police have not been able to do so. 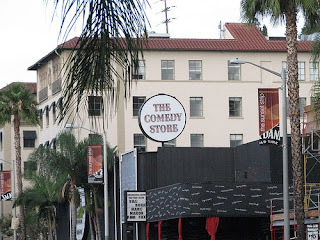 The Comedy Store is now probably more famous for the popular comediennes that it has been the breeding ground for than the mob hangout it was in the 40's. Formerly named Ciro's, this building at 8433 W. Sunset is said to have some serious funny business going on in the basement, but not the type you may think! It is believed that the murdered victims of the mob would sometimes end up in the basement and apparently they are about ready to get out of there! There have been reports of strange voices in the basement, as well as unexplainable pranks being played on the workers and the comediennes at The Comedy Store. Jim Morrison swinging from a drainpipe on the roof. Clark Gable not so secretly carrying on an affair with the just married Jean Harlow. John Lennon, Greta Garbo, Grace Kelly, the list of former Chateau Marmont patrons is the who's who of Hollywood legends. There is no wonder, though, why myself and many others have this reaction to the hotel. It is known to be haunted and one of the most famous ghosts is said to be that of John Belushi. John Belushi died of an overdose while staying at The Chateau Marmont on March 5, 1982. There have been several accounts where people staying in his room have experienced the unexplainable. The staff at the hotel are as famous for being tight lipped as it's patrons are for being famous movie stars. They are not allowed to give out any information on past or present guests, therefore, will not be able to tell you which room Mr. Belushi was in on that fateful night. According to some things I have read though, he was in room bungalow 3, if you ever happen to stay there. Since she is my favorite screen legend, I have read many books on Marilyn Monroe and have visited several other sites in Hollywood that she is said to have been spotted after her mysterious death. One of these sites is at her burial place, a tomb at 1218 Glendon Ave, in Westwood Memorial Park. It is said that a green haze is sometimes seen over her tomb. What is strange about this is that it has been speculated that Marilyn's doctor may have deliberately given her an overdose and killed her on August 5, 1962. The strange part comes in the fact that his name was Dr. Greenson. Is Marilyn Monroe, like with the story of Victor Killan and the Chinese Theater, trying to help solve her own murder? We may never know! What we do know is that she really seems to be busy after death, because she has also been spotted in front of the home where she passed, 12305 5Th Helena Drive in Brentwood. Just a note to any future ghost hunters who may be reading this post. Some of the addresses I have posted are private homes and, as you can imagine, the people who own them do not look nicely upon tourists, even ones in the forms of ghostbusters! Also, if you venture into the hotels try your best to look as though you belong there, or you could quite easily get kicked out very swiftly. Don't attempt to gain entry to the Chateau Marmont unless you have a reservation, either for dinner or for a room there. The closest you can get otherwise is the Bar Marmont, which is in a separate building below the hotel, but still a great place to check out, (and me being a chicken, the closest I would dare go towards the Chateau anyway). Also, I will tell you from experience, do not bother with any of the Haunted Hollywood Tours you see advertised around town. We went on one, the Starlines, and while there were a few true points, there were so many false stories on this tour. I guess they don't believe that tourist know the difference, but unfortunately they sometimes do as in our case! 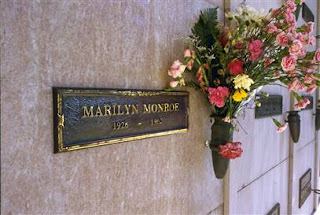 They didn't even take us to the right home where Marilyn Monroe died! Not even to the right city! We were about 20 minutes from the actual location when the tour guide announces, "On the right is the house where Marilyn Monroe was found dead. Was it by the mob? Was it by a Kennedy?" Well while I don't know if it was by the mob or by a Kennedy, I do know that it wasn't in that house! So don't waste your time and your money with those lies. Do your research and find the sites you want to see yourself. If you have any questions don't hesitate to contact me and I will be happy to help if I can! Hi, Great ghost feature! I'll be reading your haunted city blog entries this week. I hadn't heard a lot of the stories you posted before! Thanks isellartprints! I have many cool ones coming up this week. Make sure you check out the San Antonio one in a couple of days! It is really going to be spooky! What an awesome post! I love reading ghost stories and this really put me in the mood for halloween! Thank you Jewels of Saraswati! There is no better way to get in the Halloween mood than spooky stories in my opinion!